Барааны дугаар 9780199680856. Categories: Dictionaries, OXFORD. 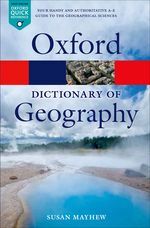 All existing entries have been fully revised and updated for this new edition, and there is now expanded coverage of Geographical Information Systems (GIS), and glacial geomorphology, as well as the inclusion of more international examples within definitions, broadening its coverage considerably. The dictionary includes more than 400 new entries, including economies of scope, marginalization,rurality, and tax havens and offshore financial centres. Recommended web links are suggested for many entries, accessible and kept up to date via the Dictionary of Geography companion website. Readership : Essential reading for students and teachers of geography, including A-level and undergraduate students.